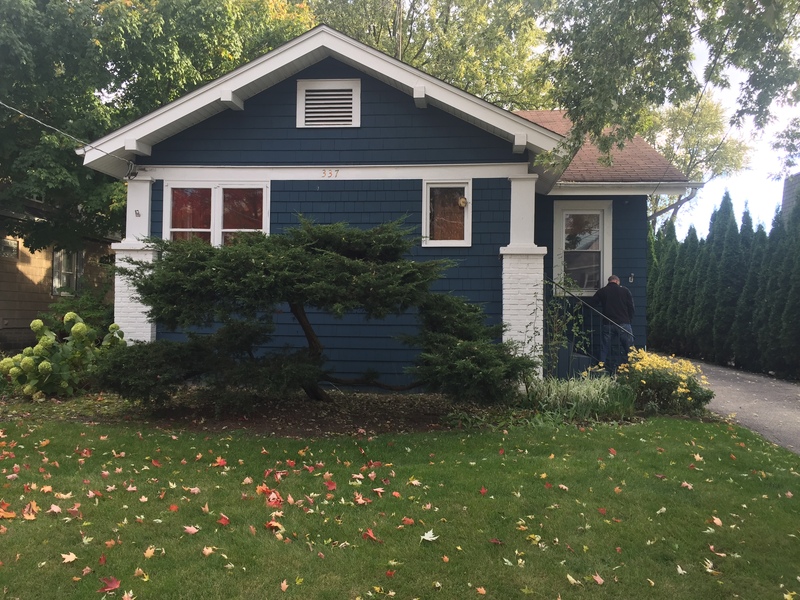 Last Friday we closed on a 1931 Montgomery Ward home that we are going to bring back to life and sell. Woo-hoo. Another flip! 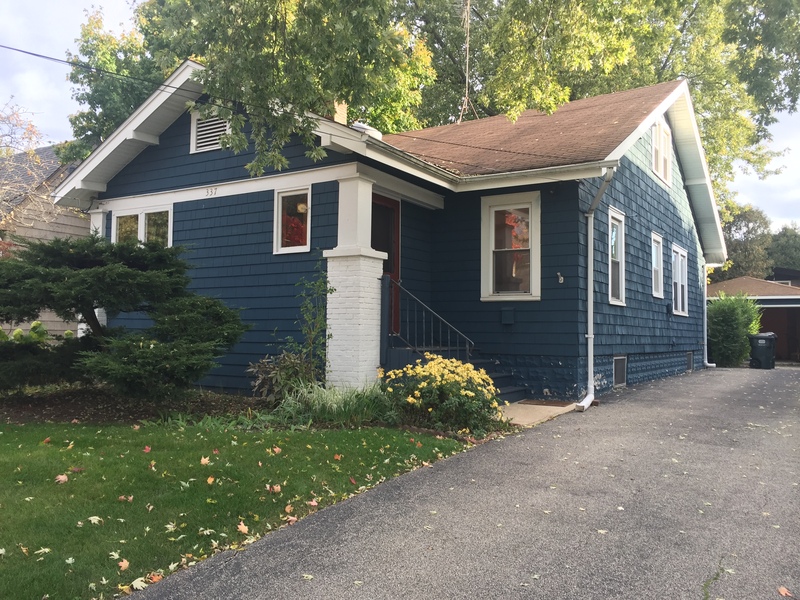 This home has so much charm and potential, and we actually used to live across the street, so we know firsthand how great the neighborhood is. 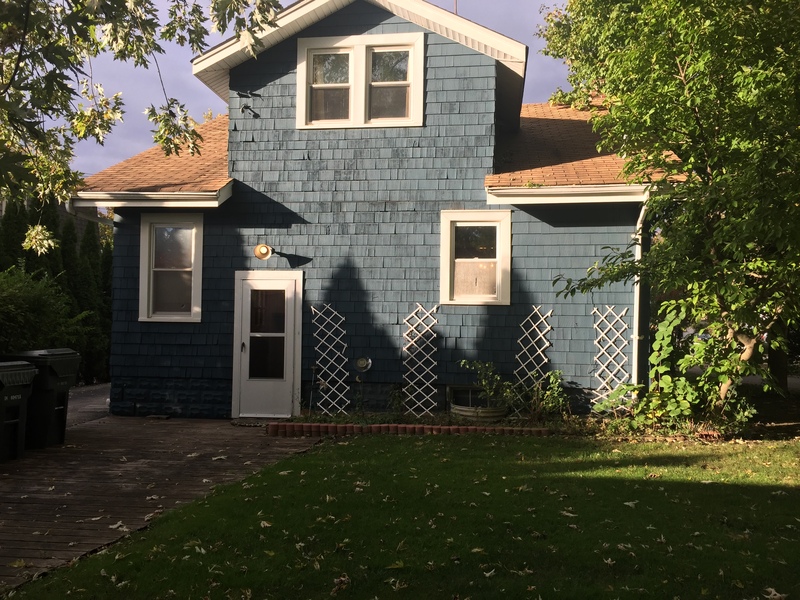 Here is the front of the house, which actually needs very little work. We love the paint color so will just touch it up where needed. That bonzai-looking tree will go and we will freshen up the landscaping in the front. The house also needs a completely new roof. 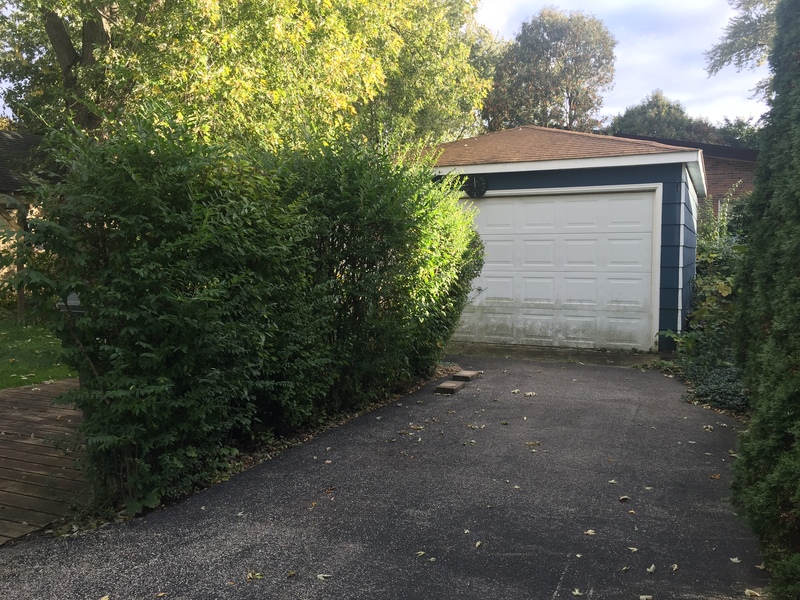 We need to make the driveway wider with fresh asphalt because right now there is a weird hedge row and wood patio that blocks more than half of the garage. 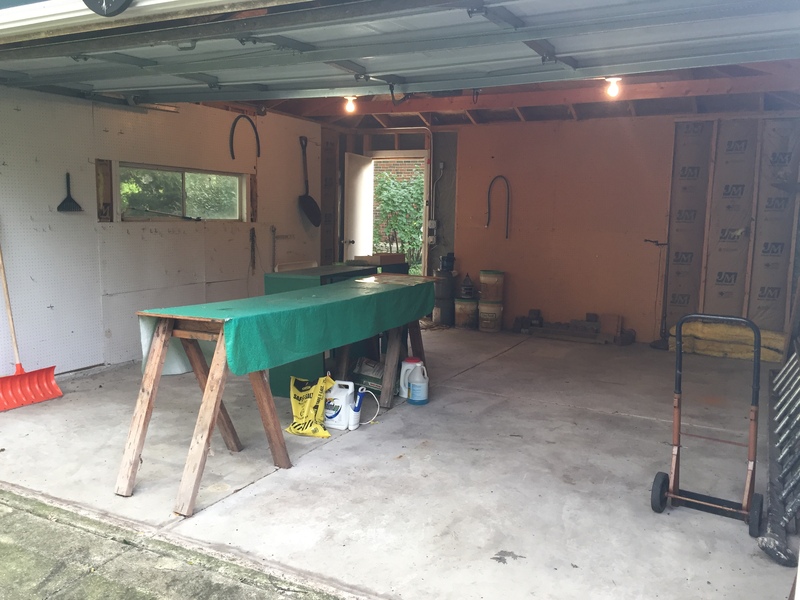 The garage is actually quite nice, you just can’t get to it right now. 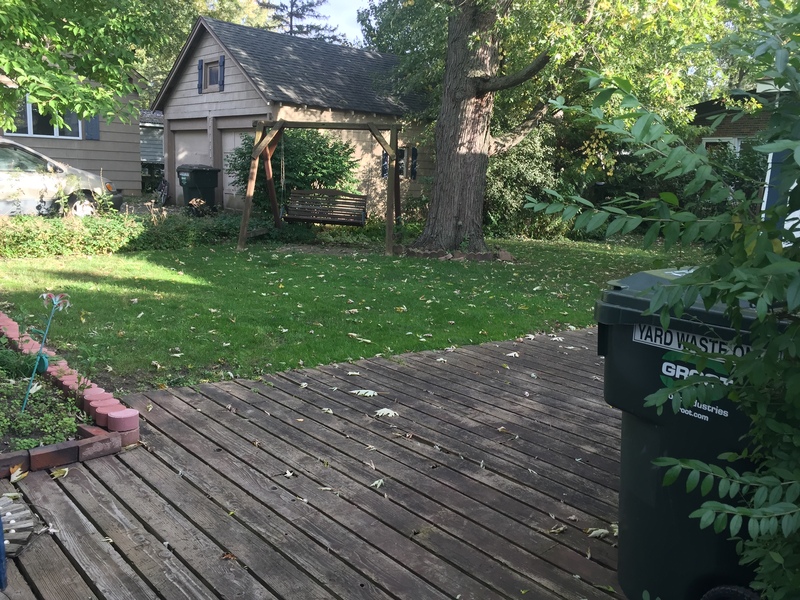 Here’s the backyard which we are going to fence in to provide some privacy from the neighbors. 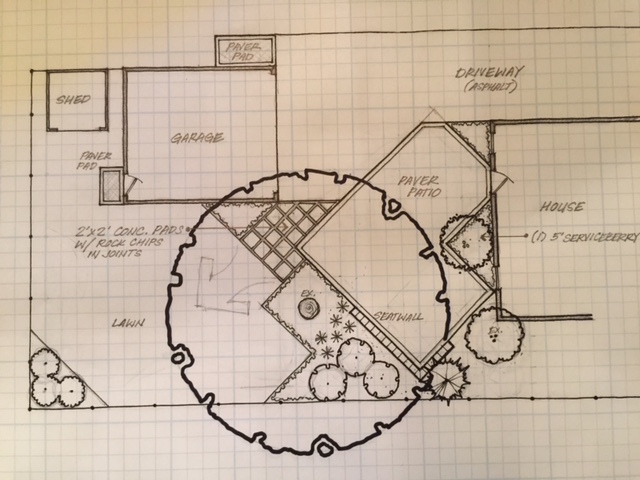 We will add a paver patio and lots of landscaping, similar to this drawing our landscape designer friend drew up for us. Here’s a couple more pics of the backyard and back of the house. 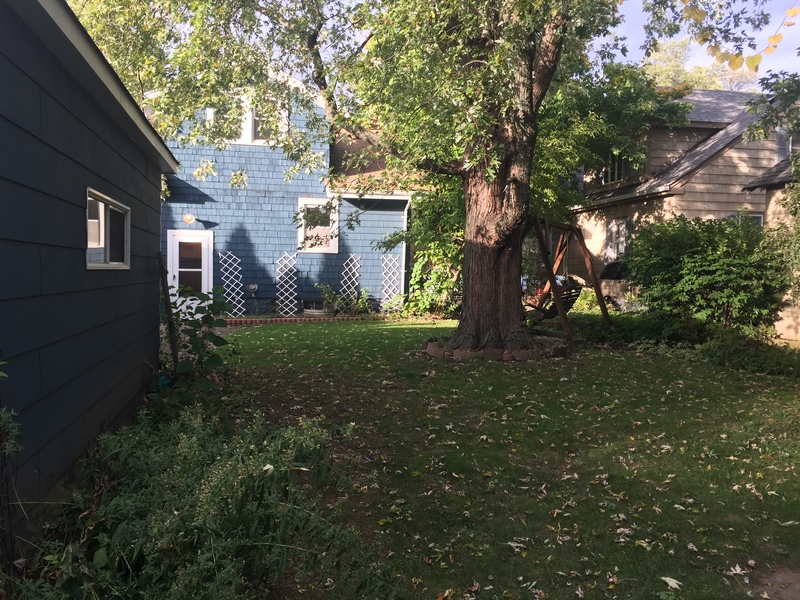 It’s a small lot (about 1/4 acre) but is very typical for this neighborhood. 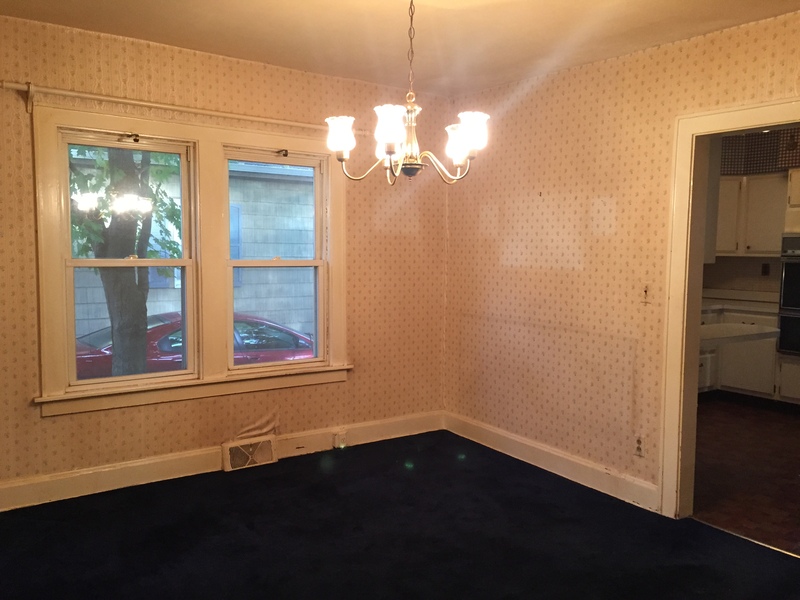 Moving inside, here is the front room which used to be a front porch. 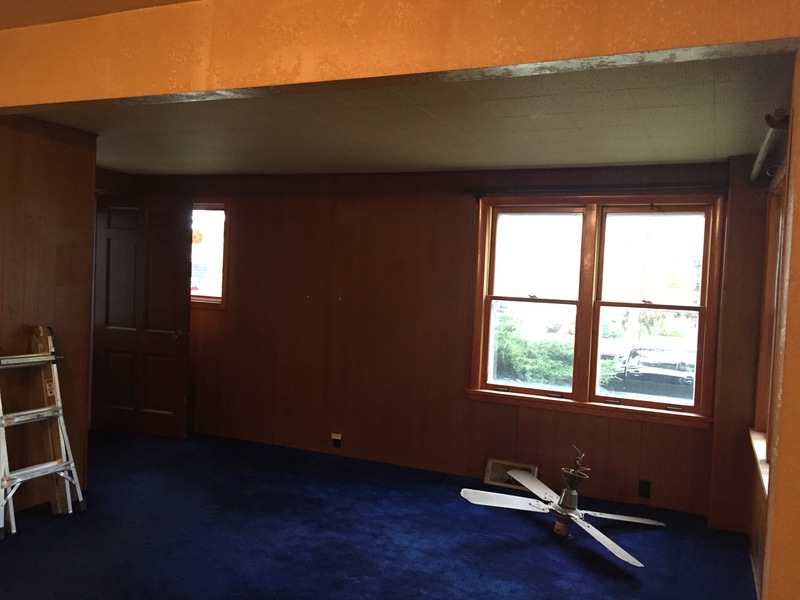 We are going to remove the wood paneling, drop ceiling, front closet, and then open up the ceiling to a cathedral ceiling with beadboard and maybe some rustic beams. It will look so different and open it up a lot! 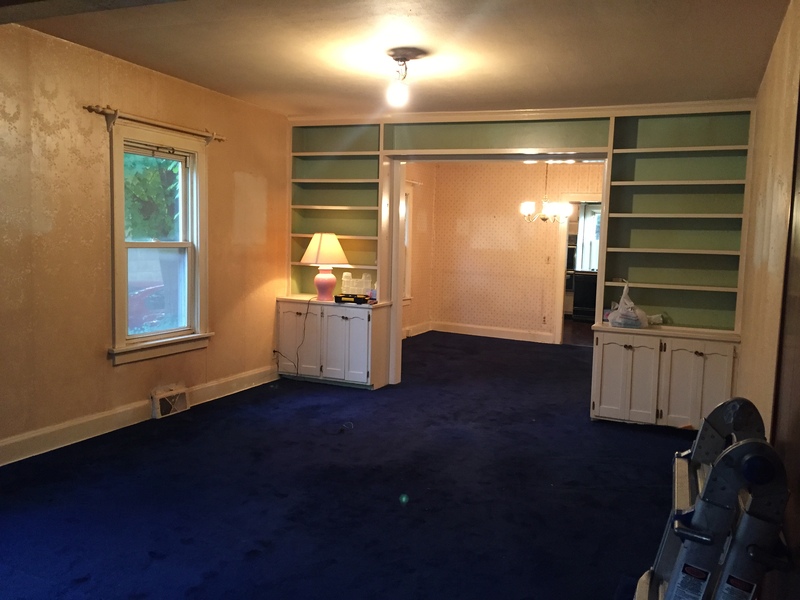 In the living room, we have to do some electrical to get the light on the switch (it was just a fan on a pull cord), remove the wallpaper and carpet, paint everything, stain the floors, and clean up the built ins. I absolutely love the built ins! If you saw on Instagram, we already ripped out the carpet and it already looks SO much better. There’s parquet flooring under the front porch area so we will need to lay hardwoods there and then stain it all a nice rich brown color. 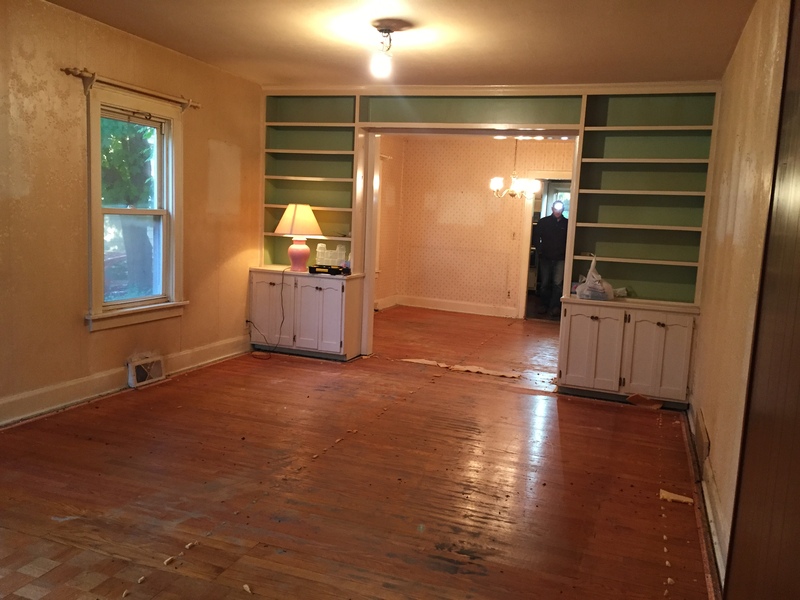 Here’s the dining room which needs a new light fixture, wallpaper stripped off, paint and floors stained. 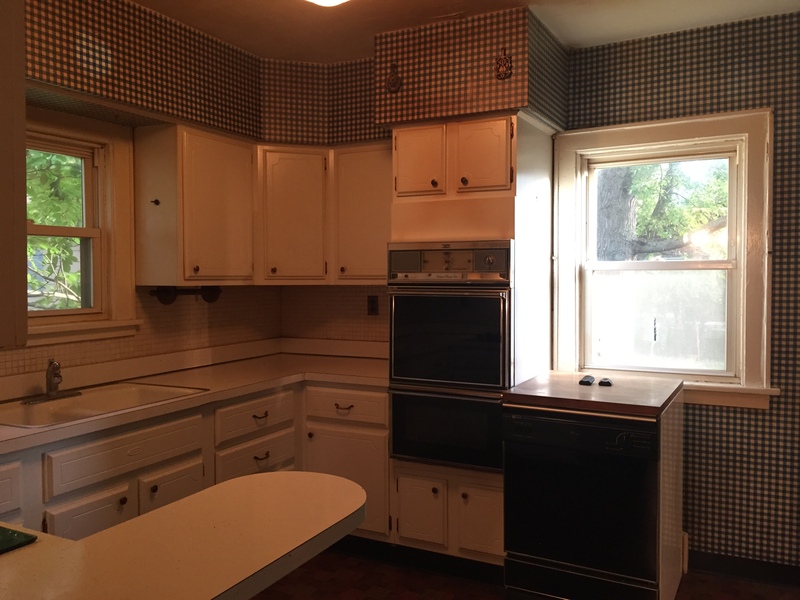 The kitchen is in the back of the house and needs a lot of work. 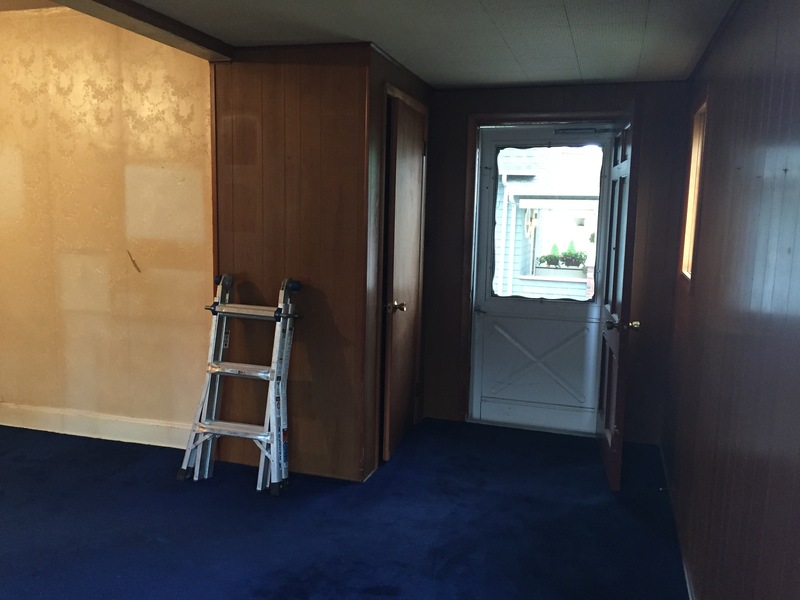 We actually plan to re-use most of the cabinet boxes and re-make the doors, remove the soffit and then add glass-fronted cabinets where the soffits used to be. We did this in our first house and it looked great. We plan to take out the wall above the current stove to open it up to the rest of the house, and add a bar height top. We will take out the wall ovens and add a slide-in range with a microhood instead. 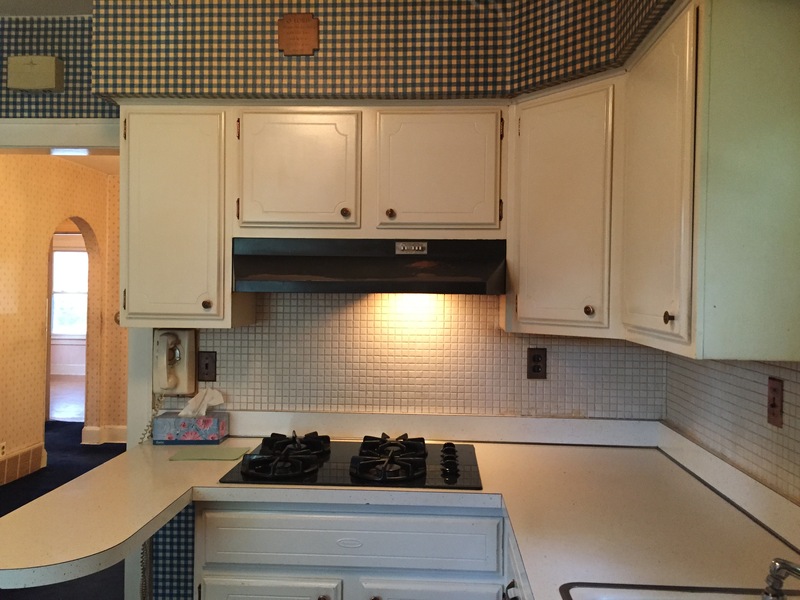 The cabinets will be painted a fresh coat of white, and of course all new stainless steel appliances, granite countertops, backsplash, sink, hardware and fixtures. 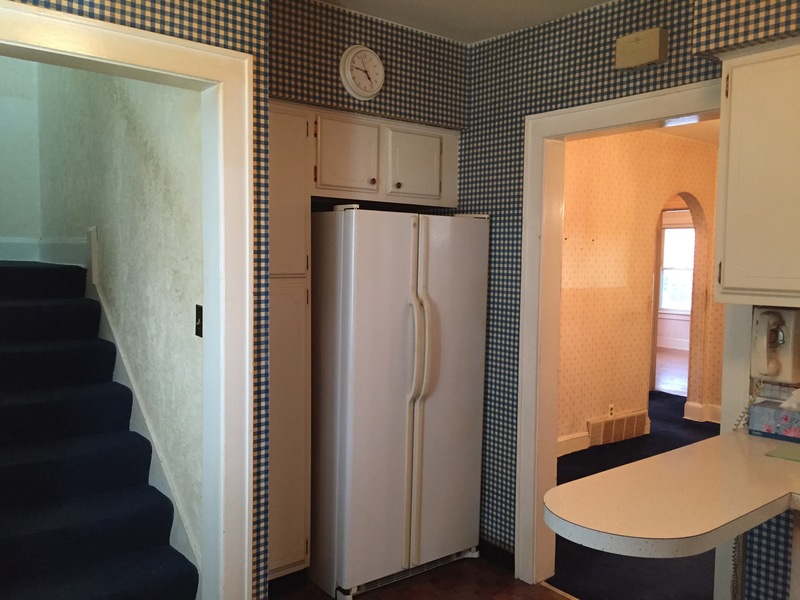 The fridge is on this wall, and we will build out the pantry cabinets deeper to line up with the wall. 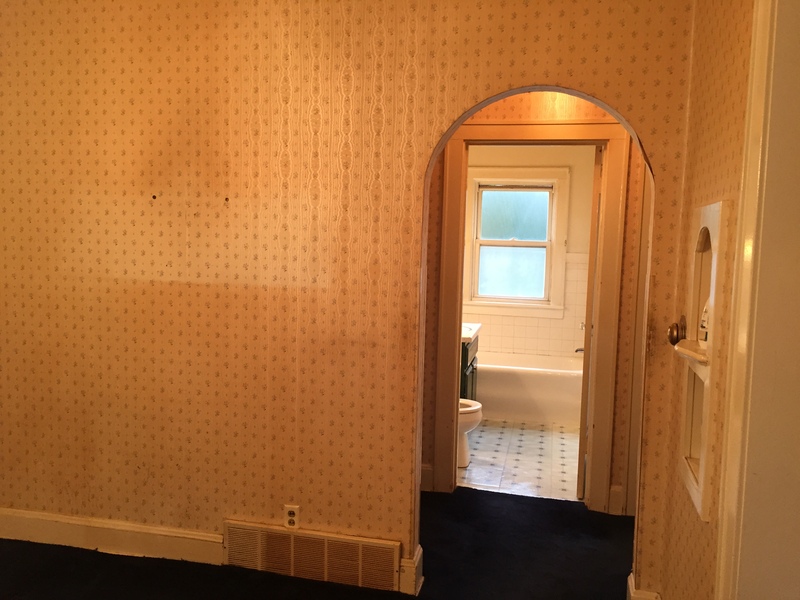 There’s two bedrooms and a bathroom on the first floor, which you get to by this charming archway. 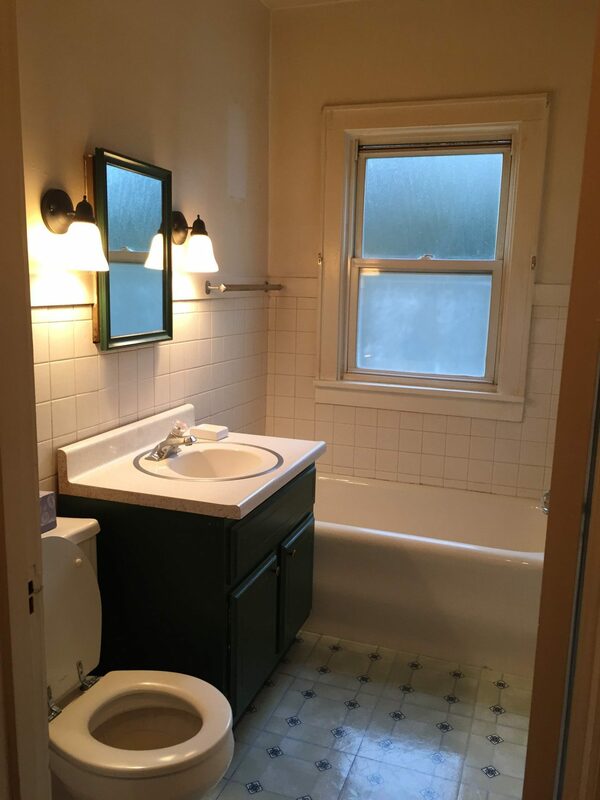 The bathroom will basically get a full gut with new tile, vanity, toilet, fixtures, and more. 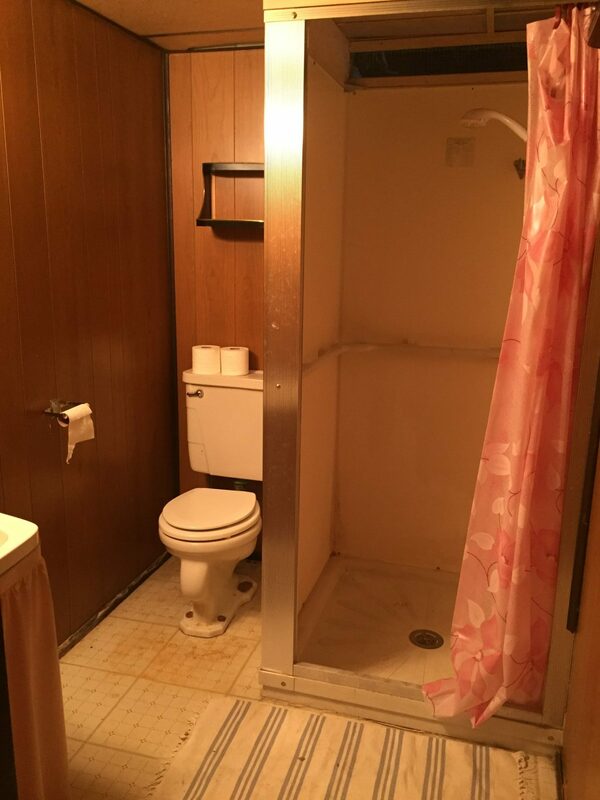 We also need to add a shower head since this is only a bathtub right now. 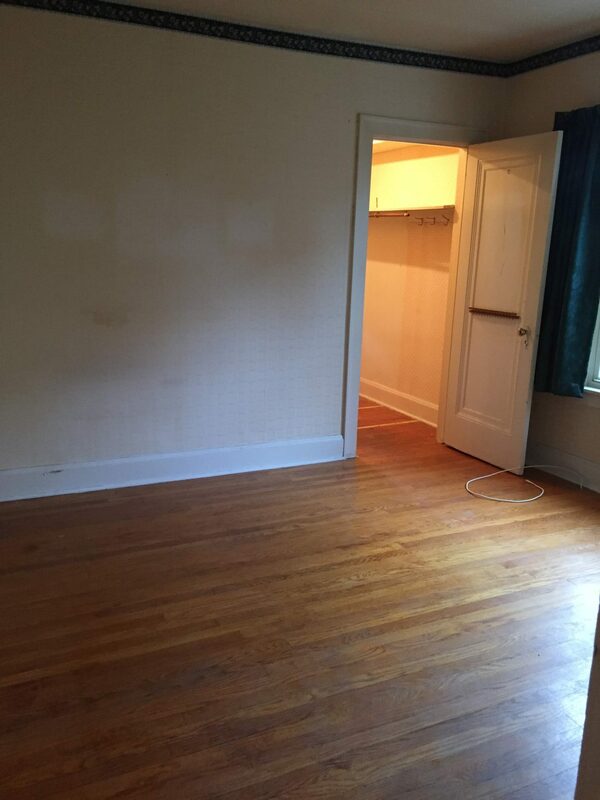 Here are the two bedrooms on the first floor which actually have large closets. 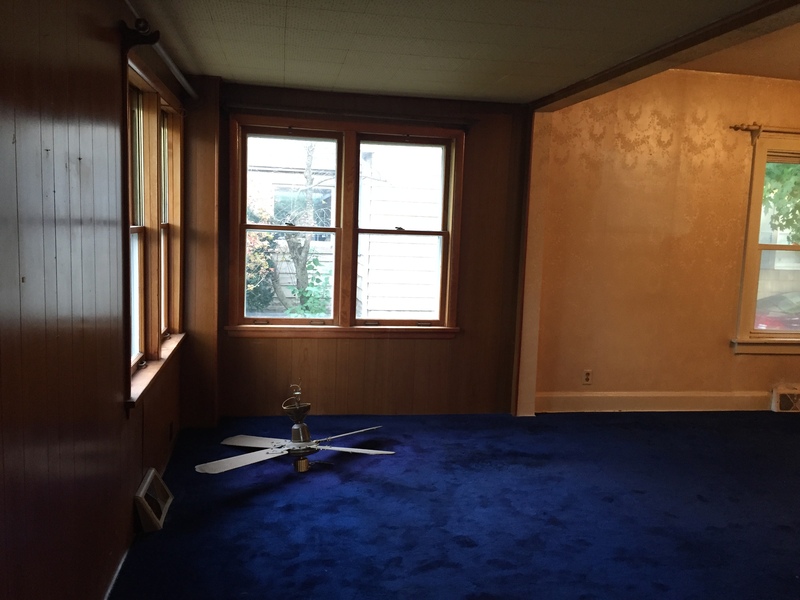 As you can see in that photo, the previous owners smoked in the house for 40 years(! 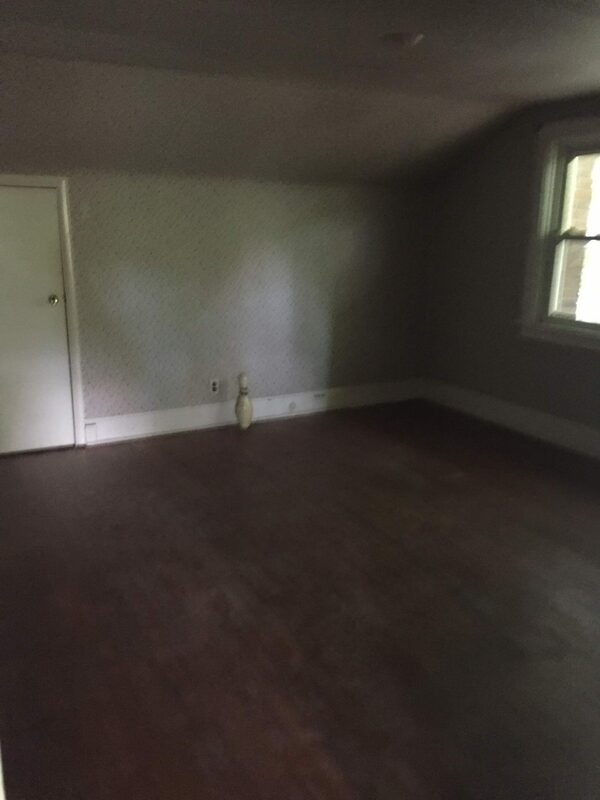 ), and so all the wallpaper is stained with smoke. 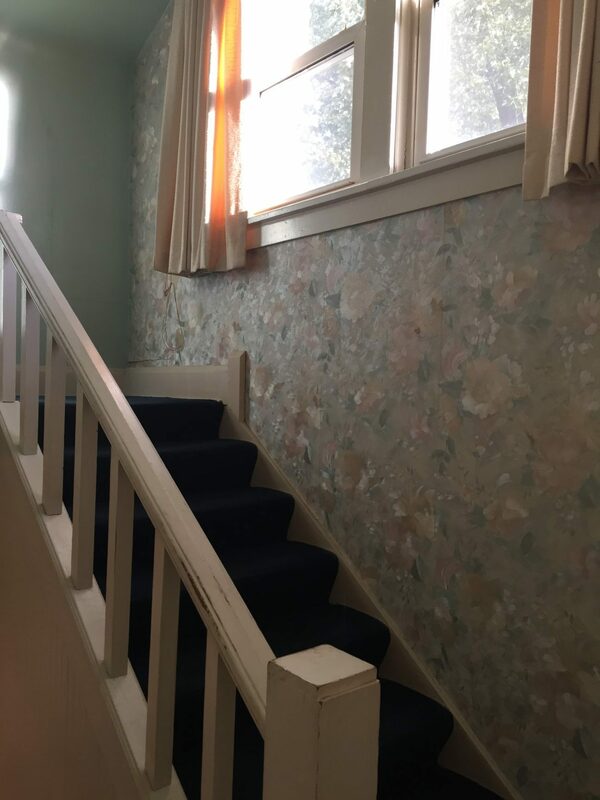 Surprisingly it doesn’t smell too bad, but we are of course stripping all the wallpaper and painting everything fresh and new. The stairs to go up to the 2nd floor are off the kitchen and they lead up to 2 more bedrooms and a powder room. 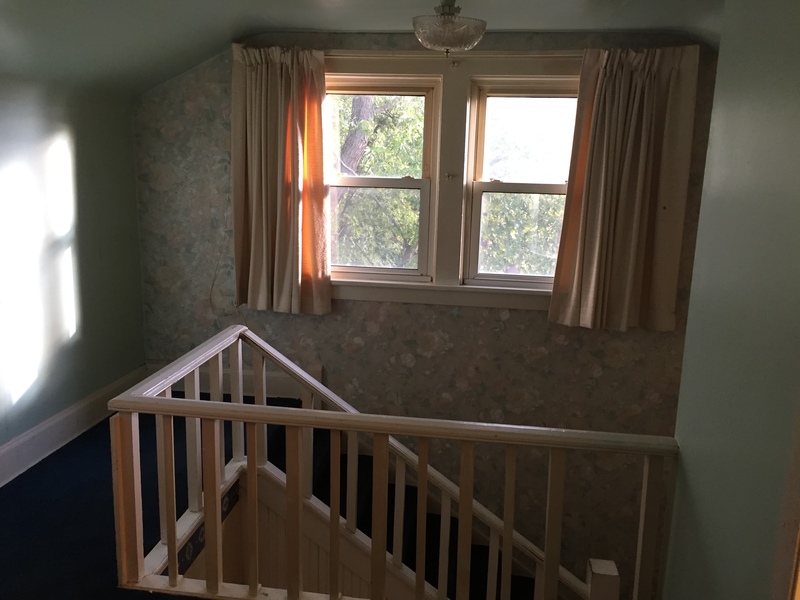 The railings aren’t up to code so those will get re-built and then we will remove the carpet, wallpaper and then paint the walls and stain the floors. 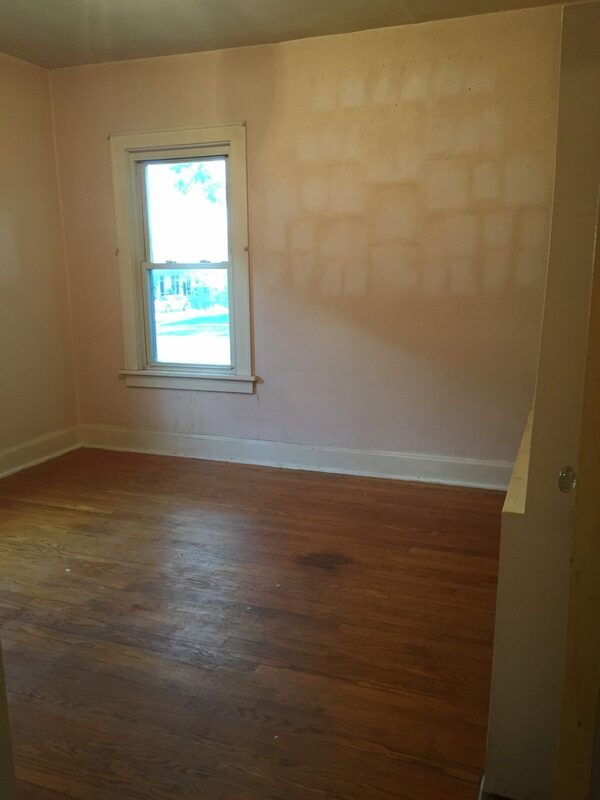 Our current thinking is to make the entire upstairs a master suite with a large closet and bathroom. So ripping out the wall between the two bedrooms and extending the current powder room which is teeny tiny. 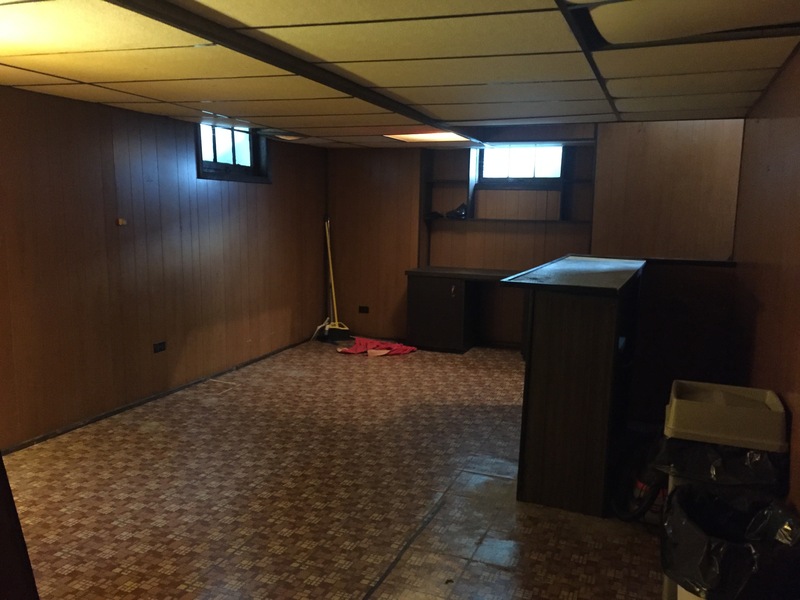 Lastly is the basement which is straight out of the 1970’s. 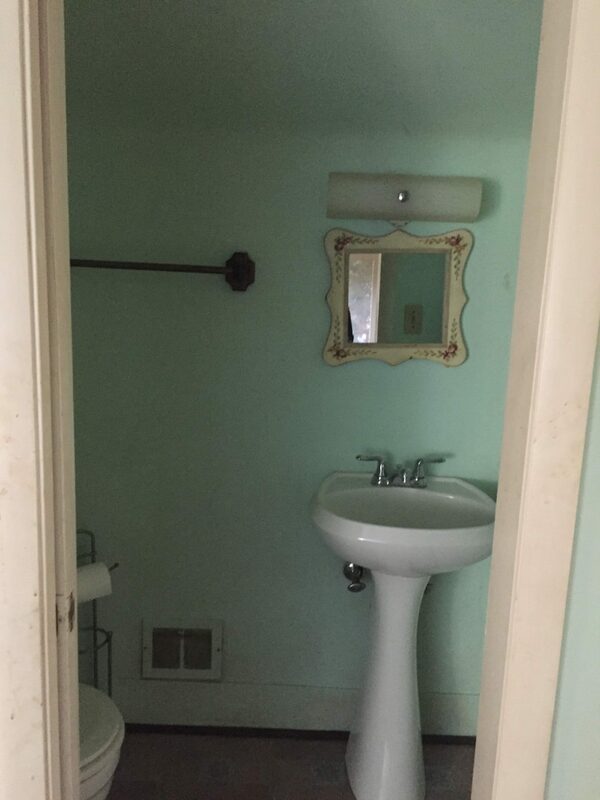 There’s also a full bathroom down here. 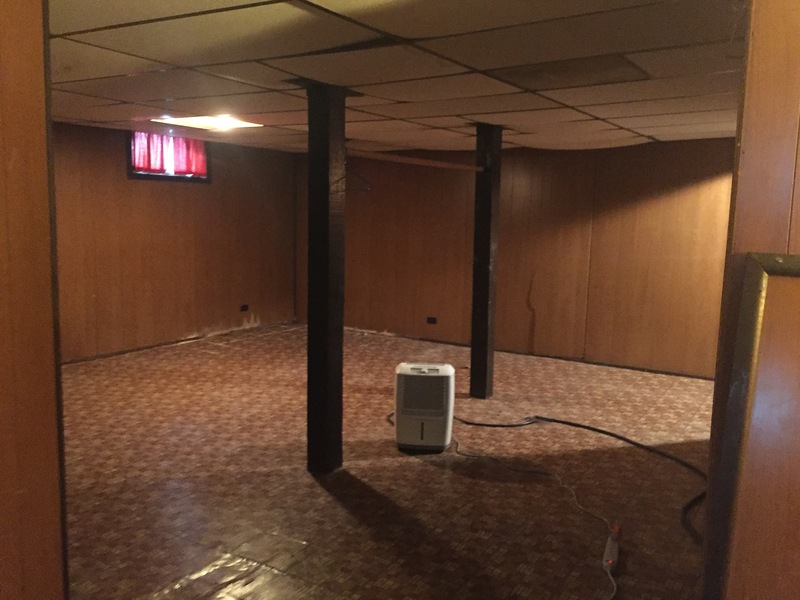 We have some foundation and waterproofing issues to deal with in the basement, so are in the process of tearing out all the paneling, floors and dropped ceilings. That concludes the tour. It’s a ton of work, but we know it will look stunning when we are done with it in a few months. 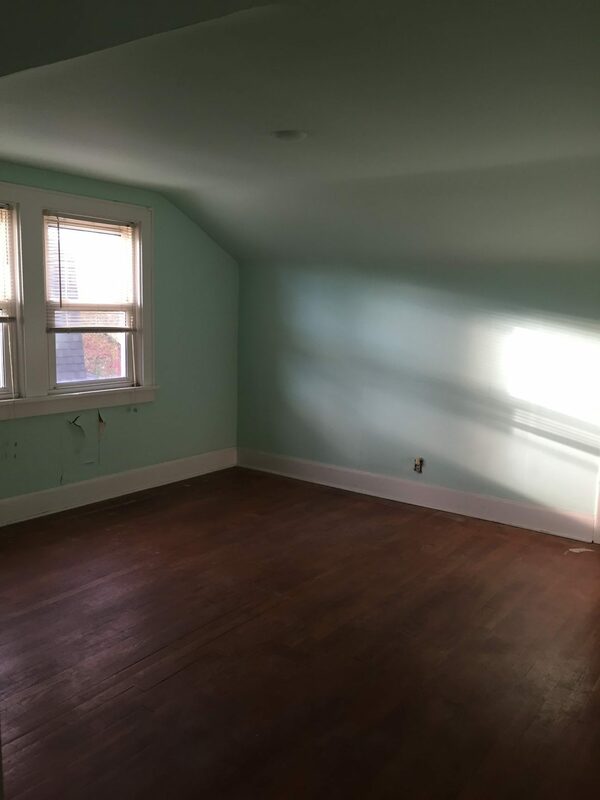 If you want to see some of the other properties we have “flipped,” the home we renovated last summer and made into a rental property was pretty similar here. And here is another flip we did 3 years ago. 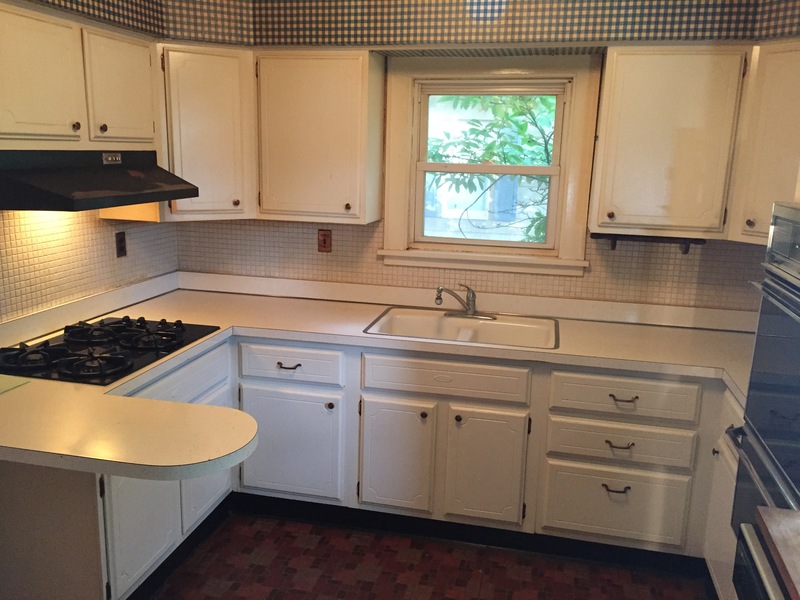 I love the Sears homes! Love your styling, and this one will look great! Oh my goodness! I love the random bowling pin upstairs. LOL. We found a bunch of bowling stuff in the house.